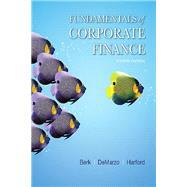 For undergraduate courses in corporate finance or financial management. Fundamentals of Corporate Finance offers a practical introduction to modern-day core principles, arming readers with a problem-solving methodology, real-life financial management practices, and an overarching valuation framework that they can apply in their future careers. Updated with new examples, exercises, and statistics, the 4th Edition gives individuals the opportunity to practice and apply concepts, while connecting them to the latest financial issues and policy in today’s world of business. MyLab™ Finance is an online homework, tutorial, and assessment program designed to work with this text to engage students and improve results. Within its structured environment, students practice what they learn, test their understanding, and pursue a personalized study plan that helps them better absorb course material and understand difficult concepts. Note: You are purchasing a standalone product; MyLab Finance does not come packaged with this content. Students, if interested in purchasing this title with MyLab Finance, ask your instructor for the correct package ISBN and Course ID. Instructors, contact your Pearson representative for more information. Jonathan Berk, Stanford University, is the A.P. Giannini Professor of Finance at the Graduate School of Business, Stanford University and is a Research Associate at the National Bureau of Economic Research. Prior to earning his PhD, he worked as an Associate at Goldman Sachs (where his education in finance really began). Professor Berk’s research interests in finance include corporate valuation, capital structure, mutual funds, asset pricing, experimental economics, and labor economics. Peter DeMarzo, Stanford University, is the Mizuho Financial Group Professor of Finance and former Senior Associate Dean for Academic Affairs at the Stanford Graduate School of Business. He is also a Research Associate at the National Bureau of Economic Research. He currently teaches MBA and PhD courses in corporate finance and financial modeling. In addition to his experience at the Stanford Graduate School of Business, Professor DeMarzo has taught at the Haas School of Business and the Kellogg Graduate School of Management, and he was a National Fellow at the Hoover Institution. Jarrad Harford, University of Washington, is the Marion B. Ingersoll Professor of Finance at the University of Washington. Prior to Washington, Professor Harford taught at the Lundquist College of Business at the University of Oregon. He received his PhD in Finance with a minor in Organizations and Markets from the University of Rochester. Harford has taught the core undergraduate finance course, Business Finance, for over sixteen years, as well as an elective in mergers and acquisitions, and “Finance for Non-financial Executives” in the executive education program.